Kayak in a new area is a great free summer activity to do. Kayaking does not have to be a lot of money and because of this it is one of the first of the free activities that we will be discussing today. At many parks, you are able to rent a kayak for maybe $10 a day. And if you already have your own, then it is free. You can look for a great deal, or score a used one on sites such as Craigslist. Go camping as one of the many great free summer activities. Something that I am always ashamed to admit is that I have never been camping. Yes, I just said that, and yes you read that correctly. Camping in the beginning might be expensive because you have to acquire everything, but after everything is bought, it then becomes very cheap to go camping. Much cheaper than going to a hotel. Camping is one of the several very fun free summer activities. Find a place to hike is one of the great free activities. I'm going to guess that there is at least somewhere around where you live where you can go for a hike. There is a park right up the street for us where we can go for a hike and it's great! One place that we would like to visit more is W's family property. They have tons of acres and miles of land to explore full of creeks, cliffs and everything else. It is so pretty, and I regret not bringing the dogs there more. Bike on trails or around your town. Yes, a bike might cost you money in the beginning, and in some cases it might cost you a lot of money. However, I do believe that the cost pays off because usually it will be a one-time cost, unless you go through bikes like crazy (lets hope not!). We have been going for bike rides a lot lately, and it's been a lot of fun. I really wish that there was a way for us to get to the Katy Trail without having to get into our Jeep (there is a river that separates us from the trail, and only cars can realistically go on the overpass since it is a highway), but it is still fun. Riding a bike is another one of the fun free summer activities for you to try. Seek out festivals for free activities to try. There are so many festivals happening every single month. St. Louis also has many free concerts during the summer with big headliners (past Fair St. Louis music includes: Maroon 5, Steve Miller Band, Nelly, The Offspring, Third Eye Blind, and much more – and all for absolutely FREE) that I happen to miss all of the time. The botanical garden almost always has something fun also. I always miss the annual air balloon show also. I would like to start doing all of these things! I haven't been to the library in a very long time. I would like to start spending at least some of my days diving into everything. Learning and reading new things, and for free? Deal! 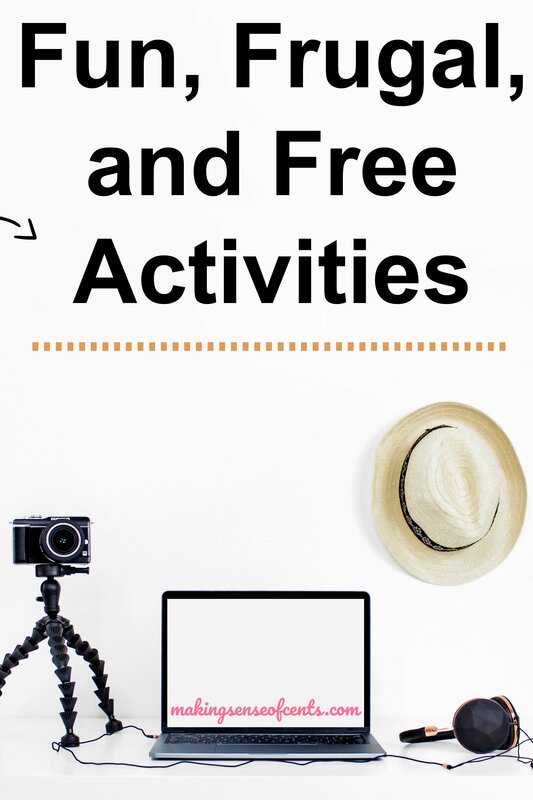 What other frugal, yet still fun, free activities do you have to add to this list? When was the last time you did something frugal and fun? Really great ideas! 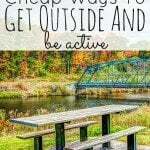 It’s so true: there is so much out there in our cities to enjoy and it’s fantastic that you are being so active outside! It’s something I really miss where I live (Brussels), there is very little access to nature in such a small, populated country, especially without a car. But back home, I used to go camping all the time – it’s not expensive at all and is really relaxing. You could probably find good deals on camping equipment on ebay, craigslist, etc. Taking walks, reading a book, having a picnic, playing badminton or soccer in a park, are all nice things to do for free in the summer. Almost free things can also be visiting local markets (cheaper produce usually) for the atmosphere, fresh food and free tastings. Cooking a new meal trying to use the ingredients you already have is also a good, frugal idea! Thanks Liz! These are all great ideas! I’ll add walking/jogging with a dog on those. It’s also a great way to keep yourself healthy and meet new people that would talk with you about your dog and their dog/s too. Yes, walking and jogging with my dog is always fun! Picnics and camping are my two favourite, low-cost outdoors activities. So much so that even if I’d the money for a posh holiday I’d still go campaign. Nothing more refreshing – and both picnics and camping are perfectly do-able in October when the days are still sunny. Just bring a cosy duvet for those crisp evenings and cuddle up with loved ones! Yes, I always love a good picnic. Yum! I have been going to the library a lot more lately. I commute an hour to and from work, so I have been listening to books on tape. It makes the drive much more tolerable. Around here the beach is another free activity that locals don’t seem to take advantage of enough, but I love. I don’t think I have ever listened to an audio book. I need to get some! Kayaking is so much fun! I almost forgot about it until I read this post even though I love to go haha. DVDs from the library as well as books (though I’ve had little to no time to read recently) are a big source of my frugal entertainment. We had a bonfire two weekends ago and that has been a fairly frugal activity, though it will be MUCH more frugal next year when we can stop buying wood since our friend’s Dad is going to help us cut down a big tree in our yard for firewood. 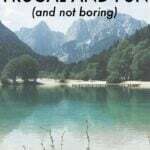 Gotta love frugal entertainment and activities! Yes, frugal entertainment is always the best! I’ve been running a lot lately, discovering new trails, would love to have a running buddy to make it even more fun! But it is as cheap as can be. We have a lot of free festivals during the year where I live. I try to attend as many as possible. I hardly ever go to them. Hopefully this changes! There’s a lot of fun to be had with little money, once you start thinking outside the box. A day kayaking or biking is surely MORE rewarding than a night at the cinema, while also eating junk food. We do some of these activities and really love them. Yes, it is definitely a lot more rewarding! I love all those things, especially hiking and camping! To help absorb the start-up costs, REI rents camping equipment at reasonable prices! I saw that recently when I was in REI. Thanks for the reminder! Great ideas! There’s a new bike renting program in NYC that allows you to rent a bike for the day for $10. It’s perfect for me since I really don’t have any space to store a bike and I only ride every now and then. Connie, the annual citibike membership is $100 for the YEAR! (and you get an extra 15 minutes per ride). I’ve had the annual membership since June and I couldn’t recommend it more. With fall I used to love going to apple orchards and pumpkin patches when I lived in Michigan and Seattle. Here I don’t do that much, but I do frugal activities almost every single day with running on the beach or beach volleyball. The only thing that can get costly about that is the temptation to go out to restaurants or for drinks after. I have to avoid that temptation every single time-especially if it’s nice out and I’ve been feeling anti-social. Yes, that is definitely a good one to add to the list. I love pumpkin patches! Haven’t been to one since I was a kid though. We’ve taken the kids to the park A LOT this summer. My two-year-old is finally big enough to play on the equipment unassisted and it’s really a lot of fun to watch. I love this post and personally do one of these things every week. So many people going through life thinking that the “mall” is the place to go when you have free time and would like to get out of the house. To me, its the world’s most life sapping and depressing place. Like you’re doing now Michelle, get and see the world – its ****ing brilliant!! Along the same lines as Kayaking, find a swimmable body of water and go for a swim! I love the library and finding new places to hike! Great ideas, kayaking sounds like another great way to not spend a lot for entertainment! Similarly, I wasn’t an outdoorsy person until I met my boyfriend. He loves nature, and I’ve always admired it from afar. Now, we go walking and discover new places around town all the time. It’s fun! We have a few parks we go to, but sadly our area is more beach-oriented than woodsy. I’ve never been camping either, but it’s something I would like to look into for the future. I also love going to the library; it’s so peaceful. I plan on getting a bike next year! I have to save up for one first. I adore outdoorsy activities. Spent the weekend visiting the park and beach by my parents’ house in CT. Went for a run, walk, swim- perfect. Also, NYC has FREE kayaking in the summer. I got to go twice this year. That is awesome that it is free! I’ve also found it useful to keep up to date on things happening within your community. There are always things that are free of charge that are going on where we live. Whether it’s a festival, block party or a movie in the park. There is also a museum we have downtown as well as an art museum that both have free general admission (they have special exhibits monthly that are a small fee…). Lots of stuff… one just has to look around! Thanks for posting, you’ve made me think a lot of more things we can do around where we live! Yup! The libraries here have movies too. I don’t know why we have never gotten any. We will have to start doing that. Hey Michelle and thanks for an enjoyable post! Like a few commenters, I am not an outdoorsy kind of guy…although I do plenty of biking to get around. Sounds like a lot of frugal activities. Good job Lyle! I love camping! And I love festivals too but I can never seem to find any free ones where I live. I really want to join the local library – that’s something I haven’t done since I was a kid! I have never been camping, but I would love to do so soon. I’ve been meaning to get into hiking, especially because the weather has been so beautiful lately! These are some great suggestions. Great tips! I’m a fan of boat rentals too. As far as camping goes, if you get a Rand McNally Road Atlas (they’re a bit large in size), they list all the federal and state campgrounds across the country so it’s a great way to find a great campsite to try out near a place you want to visit! I love something as simple as spending time in a new-to-me walkable neighborhood. My husband and I will walk around new neighborhoods to explore and find new restaurants or places we’d like to try. It’s a great way to find new things you might otherwise miss while driving by. Awesome! Thanks for the map tip. Summertime is the perfect time for free family outdoor entertainment. In Wintertime, you have to get a little more creative. Great list!! I go to cafes often with my girl friends to talk and it only costs a couple of dollars to catch up with your friends. There are a lot of free outdoor movie events in the summer time you can search in your area. I also sometimes go to a book club which helps me meet new people and read without spending a lot of money. Yes, my friends and I do that a lot also. We sometimes spend hours doing that! People pay thousands to get here and lay at our beaches, and mine is three blocks away. I spend a lot of time there. Hiking our mountains is another favorite, although I offset that with eating junk food after which isn’t so smart. Bands like MAroon 5 play in your area for FREE?! Ahhh! I would be all over that! Why, hello, fellow Missourian! 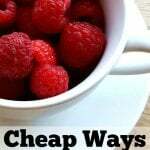 I’ve been digging around for some good and cheap date ideas for hubby and I. Love this list! Does the Muny still have the nosebleed seats for free? We used to head out with Binoculars and a picnic when I was a kid. So fun! My town has a garden club that does veggie gardens and also the islands around town, another group that meets every other Saturday to help with park up keep, painting, cutting back brush, rebuilt our Santa house. Getting involved is fun and rewarding. Finding a cheap piece of furniture and rehabing it, make some yard art. Library has speakers, high schools have plays and band nights with some talented kids. Great list Michelle! One way I found to have fun is joining local clubs. For example, our rotary club does interesting volunteer opportunities and our young entrepreneurs club has interesting speakers. They can also get group discounts– for example: the church has a men’s bible study called Bro’s, Bibles & Brews they can host their bible study at a local brewery and get beer for a few dollars off!